Placenta Encapsulation in Hawaii… Safe or Taboo? Kiersten Homalon of Aloha Childbirth is back on Oahu! She is a dear friend of mine who was actually my own placenta encapsulator. We met in 2016 when I was pregnant with my second child. 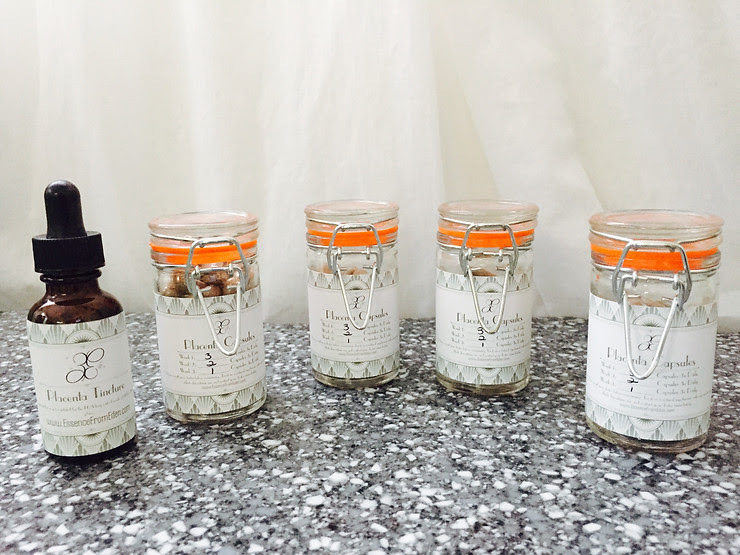 She is a gentle kindhearted wife and mama to two, an amazing postpartum doula who specializes in placenta encapsulation and herbal remedies. Mahalo for guest blogging Kiersten! In America the topic of Placenta Encapsulation is still very foreign, I have even heard some refer to the idea as “Alien like”. Its as far from our culture and understanding that it could possibly be. 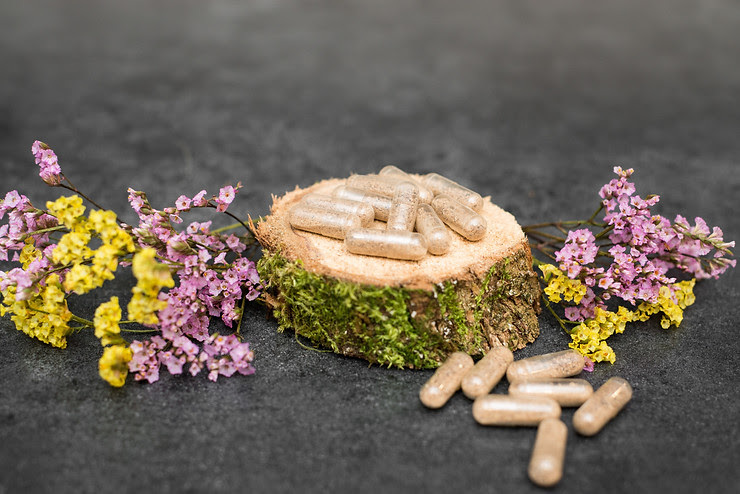 Only recently has the idea of placenta encapsulation been brought to light as certain celebrities and circles of “crunchy” mothers opened up about their choices to encapsulate. Placenta Encapsulation getting that exposure is not necessarily bad, though I strongly feel that the way it was introduced to America as a whole… through a Kardashian, strongly tainted the Traditional Chinese Medicinal Practice and turned it more into a fad. I am still so happy that she encapsulated though! Fact is, Placenta Encapsulation has been around in Chinese Medicine for thousands and thousands of years. It is respected and seen as a miraculous organ that is not only powerful during birth to protect the fetus, but it is potent after birth to help postpartum mothers heal. The placenta is also used for a wide variety of other ailments in Traditional Chinese Medicine such as epilepsy, asthma, skin ulcers, pulmonary diseases and more. Recently there has been controversial articles being brought up that suggested that maybe encapsulation was not safe, could cause infection, or event hurt the production of breast milk. One such case study was done by the CDC just last year. You can find that study here. This study revealed that a newborn had gotten sick with infection and had to be hospitalized due to the severity of this infection. The CDC suggested that it was caused by the mother’s consumption of Placenta Pills that she had prepared for her by a specialist. This case was not clear if the placenta had been processed properly, additionally the baby could not have gotten sick from the mother’s milk considering the tests results came back negative for her milk possessing the GBS bacteria. So the babies infection could in no way come from the placenta capsules, unless the capsules were somehow orally given to the infant, which is in no way recommended. Thankfully, now the need for research to be done on Placentophagy (Consumption of the placenta) is being realized. Since the CDC released this inconclusive study another larger study has been done this past month in May 2018. You can read that study here. This study revealed that Encapsulation is SAFE for mothers and poses no threat to infants! Placenta Capsules have no taste and are a great way to nourish yourself after giving birth! It is important to hire a specialist that abides tightly with the OSHA guidelines for encapsulation, and adheres to the Blood-borne Pathogen safety for maintaining the integrity of the organ and the safety of the capsules when they are complete. Some Safety measures to make sure your specialists abide by are below. Knowing the benefits of the Placenta is eye opening. It truly is a miraculous organ in so many ways! 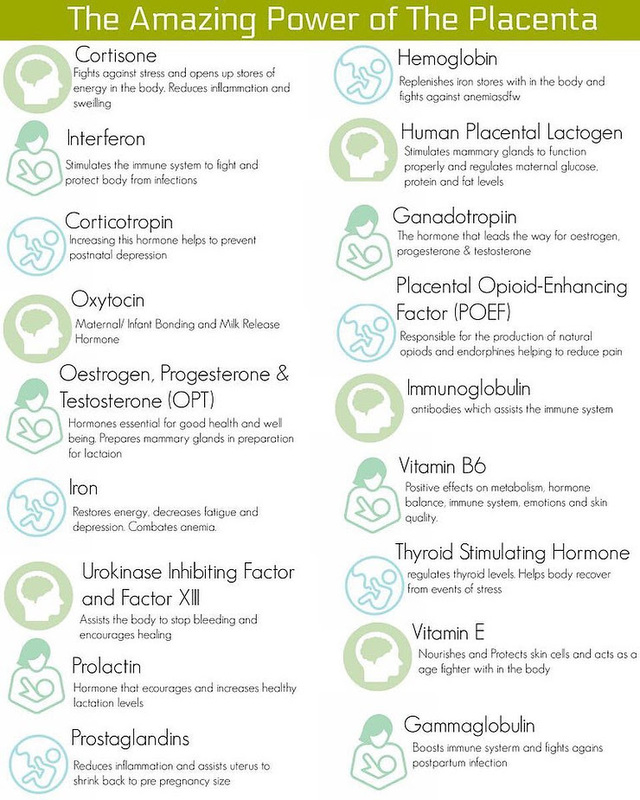 Below are the benefits you reap when consuming the placenta postpartum! My hope is to help normalize placenta encapsulation, especial when aiding women who are subject to Postpartum Depression and anxiety. I am one of those mothers, and the beauty and power of my placenta with both my babies inspired me to become a highly qualified specialists and inspires me everyday to continue serving families and advocating for postpartum care! Happy birthing sweet one… and above all breathe into postpartum. 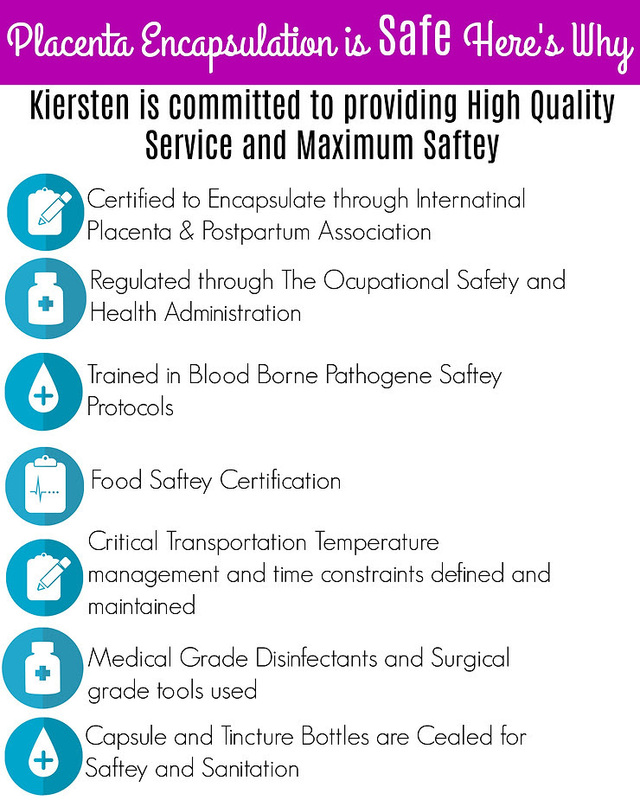 To book your Placenta Encapsulation Services with Kiersten click HERE !